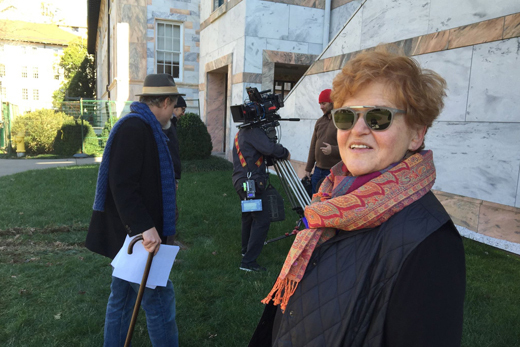 Emory professor Deborah Lipstadt's internationally publicized legal battle against a Holocaust denier is the subject of the new feature film "Denial," which brought a film crew to campus last week. 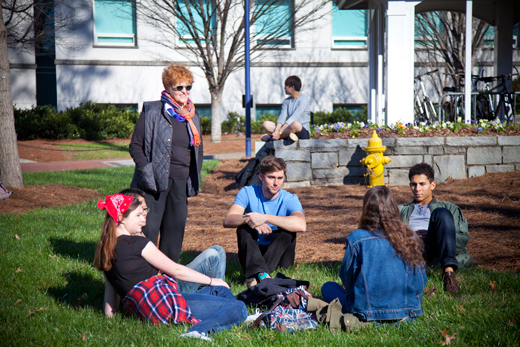 On a cool, sunny afternoon, professor Deborah Lipstadt stood on the Emory Quadrangle watching her past come to life. Trailed by a camera — and the curious gazes of passersby — what appeared to be an earlier version of Lipstadt strode purposefully across the grass talking into a 1990s-era cell phone as clumps of Emory students filled in the background, chatting, laughing and playing Frisbee. To the students, conspicuously clad in flannel, movie producer Russ Krasnoff offered a bit of direction. "We're going to do this as quickly and painlessly as we can," he said. "You all look wonderfully '90s." And so it was that the Quad turned temporary movie set last week, as a film crew came to campus to shoot final scenes for "Denial," a new feature film inspired by Lipstadt's internationally publicized legal battle against a British Holocaust denier. Based upon her acclaimed 2005 memoir, "History on Trial: My Day in Court with a Holocaust Denier," the film stars Academy Award-winning actress Rachel Weisz as Lipstadt, two-time Academy Award-nominee Tom Wilkinson as her British barrister and Timothy Spall as Holocaust denier David Irving. Producer Krasnoff, director Mick Jackson and a camera crew arrived at Emory to capture final exterior shots of the campus — a visit that also meant an opportunity for classroom dialogue and cameo appearances for a handful of Emory students invited to serve as background extras. "You get to see what goes into making a film," said movie extra Jenny Jiang, a junior majoring in film and media studies with a concentration in film and media management. "I love Emory for this. It gives you these kinds of opportunities." Watching from behind the camera, Lipstadt marveled at how circular this journey has been, seeing her story translated from book to film. "These will, in all likelihood, be among the final scenes that are shot," observed Lipstadt, Dorot Professor of Modern Jewish History and Holocaust Studies at Emory, who served as a consultant on the film. "The fact that it's ending here at Emory, where for all intents and purposes it began, is very symbolic," she added. "I speak and talk and write a lot about symbolism and in this case, it couldn't be stronger." In 2000, Lipstadt made international headlines when she was exonerated in a British court on libel charges brought by Irving over passages in her book that identified him as one of the most dangerous proponents of the denial movement. Stepping back to that time through making the film "has been an emotional rollercoaster," she said. "One of the things that has struck me so strongly is their desire for authenticity. As a scholar, I can't tell you how much I appreciated that and value it." In her memoir, Lipstadt acknowledged the support of Emory's former President Bill Chace, colleagues, staff and students throughout the ordeal. Following the trial, Emory established a website to ensure that a documentary record of the trial would be available for research and scholarship. In fact, it was while perusing an Emory website in 2009 that Krasnoff first discovered Lipstadt's story, he explained during a visit Feb. 3 with students from two classes taught by Emory film and media studies lecturer Eddy Von Mueller, including "Film and Media Criticism" and "Content Creation," the capstone course of the film and media management concentration. Krasnoff told the students that he'd read an article about how an Emory website on Holocaust denial was being translated into four new languages — including Arabic, Farsi, Russian and Turkish — to help spread the site's message and facilitate further scholarship. Krasnoff was intrigued, read Lipstadt's book, then reached out to former Emory College of Arts and Sciences Dean Bobby Paul and Lipstadt "to say I thought it was amazing and fantastic what they were doing, that a university would do such a thing and support a professor in that way." He also suggested they consider other ways of sharing the information with audiences who lacked access to high-speed Internet, such as a documentary film. "The more we read about Deborah's story, the more we felt it should be a dramatic film and not a documentary," he recalled, noting that Lipstadt agreed. Krasnoff says he found Lipstadt's story compelling on many levels. "First of all, I couldn't believe that a professor from Emory University in Atlanta could find herself in the circumstances where a Holocaust denier is suing her for libel in a British court of law, and comes to learn that their laws are different from ours, and in fact the burden of proof is on the accused and not the accuser — and if she didn't defend this, there would be a finding in a Western civilized country that the Holocaust didn't happen," he explained. "It felt like an incredible dramatic journey for this strong, powerful woman to go through," Krasnoff said. "The fact of the story being relevant today is really why we're making the movie," he continued. " It's not just a chronicling of what Deborah Lipstadt went through, and her journey and her experience, but rather when you take a look at people trying to make their own truth today — and it seems to be happening more and more —that's what makes it an important story." About 90 percent of the film was shot in London, where most of the story took place, and also locations in Poland. Yet it was important to capture images here at Emory "because it started here, it was where I became familiar with the subject and the story," he said. "We needed to set the stage, to know where we are. Emory is a big part of Deborah Lipstadt's life." Shooting last week focused primarily on the Emory Quad, as well as a few other area locations and street scenes, Krasnoff said. "I'm happy to be here," he acknowledged. "For my partner, Gary Foster and I (Krasnoff/Foster Entertainment), this is more than just a dramatic story. This is something that matters to us." "As for the specific subject, I feel honored to be part of recording that history, those facts," he said. "I think this is going to stay with people, to get them to think and talk and explore further." The film will come out from Bleecker Street this fall.